Ever since getting the iPhone 5S I’ve been buying the Apple Leather case for each iteration of the iPhone that I’ve owned. When I was able to try out a leather case from Mujjo I jumped at the chance since the Apple leather case is my absolute favorite case. Will the Mujjo be able to stack up against my favorite case? Let’s find out! The build quality is on par with the Apple Leather and it feels great in the hand. The color I received was the tan color and while it’s nice I actually prefer the saddle brown color on the Apple leather case. 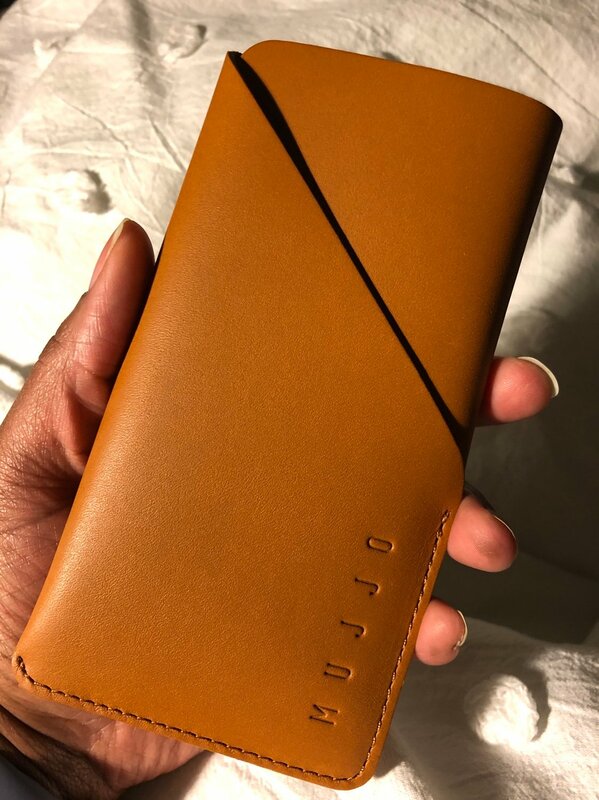 Unfortunately, if you like color options you’re going to have to go to Apple or look elsewhere as there’s only three colors total for the Mujjo full leather case. In addition, the other colors are olive and black. While I love the case, I need my options for colors and just having three isn’t cutting it. Putting the case and taking it off is a breeze and as far as the buttons go, they are molded into the actual case and I have to be honest I like Apple’s metal clackity buttons on their cases better. After putting the case on my phone, I did a squeeze test and noticed that the case wasn’t snuggly fit to my phone as there was quite a bit of give on the power button side. Mujjo does offer a leather wallet case if you prefer that. I only used the case for about a week, so I can’t really say how fast the leather is going to start developing a patina but, in that time, I was using it the case looked basically like the day I took it out of the packaging. The Mujjo case is a good alternative if you don’t want to buy the Apple leather case or if you want a leather option that’s cheaper than Apples folio but to be honest at around 43 Euros, you’re almost better off getting the Apple leather case if you don’t want the wallet case. Click here to check out the case selections for yourself. Great review!! I too love the Apple Leather cases but for my XS, I decided I’d go naked. I tend to go back and forth a lot. Since I’ll still need to toss my phone in my bag, I purchased a Mujjo wallet sleeve & I love it. I do wish it came in olive. If Apple made a leather sleeve, I would jump on it in a heartbeat. Thanks Nikki!! I’m going naked right now haha. Call me what you want but I wouldn’t use a case that don’t let me see the Apple logo on the back of my iPhone. Don’t get me wrong: I don’t have to show it to other people. It’s just for me. I’m only using Apple’s cases or clear back cases.